CBS correspondent Elizabeth Palmer is a brave woman who has covered news from various war zones. During her time at the war zones, she had to sacrifice the comfort of living by her family's side. But despite her absence from the family for months, what’s made work easier for her is the support of her husband and children. Elizabeth Palmer is a journalist best known as the news correspondent for CBS since 2000. She currently serves as the CBS News' senior foreign correspondent based in London. Her reporting are featured in all broadcasts of CBS News including CBS This Morning, CBS News 24/7, CBSN, and CBS Evening News. Previously, she also served as a correspondent for Canadian Broadcasting Corporation and Latin America Bureau. She was the recipient of Alfred I DuPont-Columbia University Award(2018) for her reporting on the siege of Aleppo in Syria. Born as British in London, details about her birthday and date is still unknown. But, what remains known is that she was raised in Canada after her family immigrated when she was a young age. The British-Canadian completed her undergraduate degree in English from the University of British Columbia with honors. Later she graduated from the University of Cardiff with a Master of Arts in journalism. CBS News Correspondent Since 2000, How Much Salary Does Elizabeth Palmer Earn? Her professional career in broadcasting started off as a special correspondent for the Canadian network in 1988. In the 1990S she covered the crash of ruble and the Chechen War based in Latin America, Russia, and Central Asia. From 1994-1997 she served as a senior correspondent for Latin American Bureau in Mexico City. After that, she joined the Canadian Broadcasting Corporation as senior correspondent and bureau chief in Moscow from 1997-2000. She embarked into the CBS Network in 2000 as a correspondent based in Moscow. Since 2003 she has been serving the network based in London. 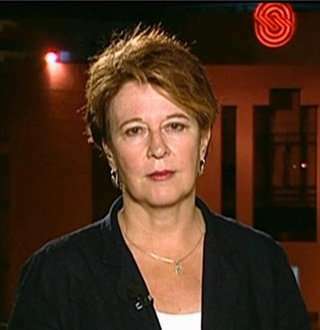 Over her career as a reporter, she has covered almost all the major conflicts in Syria, Afghanistan, and Iraq. Working as a CBS news correspondent for almost two decades she has been earning an estimated average salary of $102,548/ year. Elizabeth was born into a family who followed extremely healthy eating habits. But despite feeding on green veggies and healthy meals, the once average weighted Elizabeth, who never had to care about weight loss, fell into the hole of junk food during her middle school days. The result of her unhealthy eating habits showed its outcome later in the years. Back in 2010 due to her increasing body weight, she suffered from slight depression as no matter how much she tried her weight loss goals failed. But now comparing her pictures from 2018 to previous, Elizabeth has finally pursued the weight loss she aspired to achieve. Along with her husband, her kids have been very supportive of her work too. The kids always took her absence positively which has helped her escape the state of guilt-ridden motherhood. Mom, you know, a lot of the guys at school have fathers in Afghanistan, but I'm the only with a mom there. It’s great to see brave women like Palmer doing what she is doing. And what’s more amazing is that there are men like her husband who are equally supportive!